Braces aren’t just for teenagers anymore. 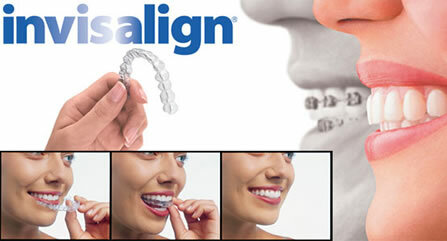 Stop worrying about having a mouthful of metal and start planning for a straight, healthy, and beautiful smile with the clear, easy treatment of Invisalign aligning trays. You shouldn’t have to sacrifice getting the healthy, straight smile you desire because of your budget. Most major insurance companies are accepted so you can afford your treatments more easily. If your teeth are crooked or crowded and you are ready to create a straighter, more beautiful smile, you don’t need to advertise it to the world. Don’t let your teeth straightening get in the way of your life. With Invisalign, clear, custom aligners are worn most of the day and changed every two weeks to gradually and gently guide the teeth into a more appealing look. If you are like most people today, your days are already scheduled weeks and even months in advance. This can make fitting your dental appointment into “normal” business hours next to impossible. Call us for weekend appointment availability so you can enjoy a straighter, more beautiful smile faster than you can imagine.